Flower Park area, Sabarmati Riverfront, Near Vadaj, Ahmedabad City, Gujarat. 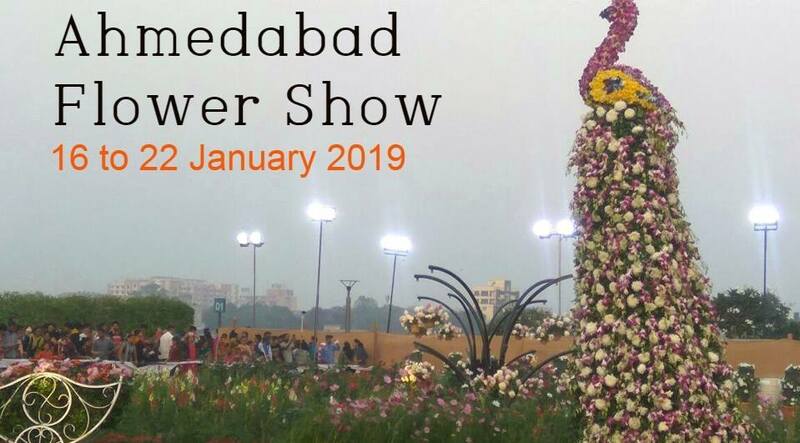 Here comes the 7th edition of Ahmedabad Flower Show 2019.
these flowers and plants adorned everything from the lawns to built forms, specially designed for the show. There were around 50 sculptures made from flowers and plants, ranging from nocturnal animals to dinosaurs to birds in the pond and the signature peacock. Flowers we have never seen before, read about or seen only in books and flowers we see every day, the show has them all. Flowers like Aster and Hypoestes to Gulmohar and Shatavri, these plants have been grown and maintained with a lot of love and care. Attractions :- In this flower show, more than 50 sculptures will be made including Gandhiji Charkha, Sea Plane and bullet train. This flower show will showcase various flower-plant exhibitions of 12 nurseries from the country and the city. For the first time this flower show has a ticket of 10 rupees, which you can get by making a payment with a Jan Mitra card or you can also take from there.